Fame is fickle. Paolo Porpora will tell you that much. 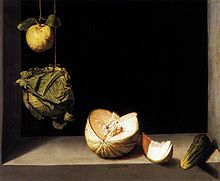 Born in 1617, the Italian painter of still lives is not a household name. But this has changed, overnight, ever since a boy, visiting ‘The Face of Leonardo, Images of a Genius‘ exhibition held at the Huashan Creative Park in Taipei, Taiwan, tripped and smashed a hole in Porpora’s Flowers. 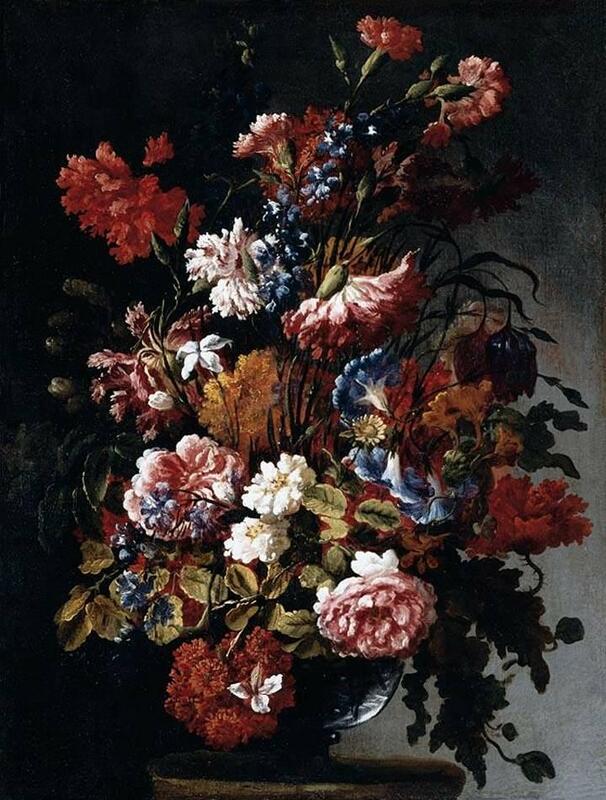 The painting, dated around 1660 and apparently the only work signed by the artist, depicts sunflowers, roses, tulips and carnations. Now, it boasts a gash, the size of a fist of a twelve-year-old. Accidents do happen and as far as art bunglers go, this boy is in good company. Elbowed Picasso’s, shattered Qing vases, viewers getting caught in Tracey Emin’s barbed wire, Damien Hirst’s ashtray and dirty cups getting an overnight clean-up by the museum staff, … it’s all part of art. But the most striking aspect in this latest Porpora debacle seems however not to be the boy falling onto the painting but the boy holding a drink whilst falling. A cup with a straw. Was it coke? Lemonade? Bubble tea? Who knows? And from the footing – oh yes, there is video footage – the boy obviously tries not to spill his drink. Because that is what he has been taught. “Don’t spill your drink”, while what he should have been taught is, “Don’t bring your drink into a museum”. A Porpora painting being accidentally damaged is not per se world news. Not in the light of falling stock markets, armed men on the Thalys, plane crashes and migrant horror stories. And yet it is a story of frailty, of failure, of behaviour and etiquette, of insurance companies, curators, restoration and conservation. And clumsiness. In this visual age, still life painting rarely make the headlines. In a museum, people gladly walk past canvases filled with flowers and fruit baskets, slices of salmon and hanging meats. 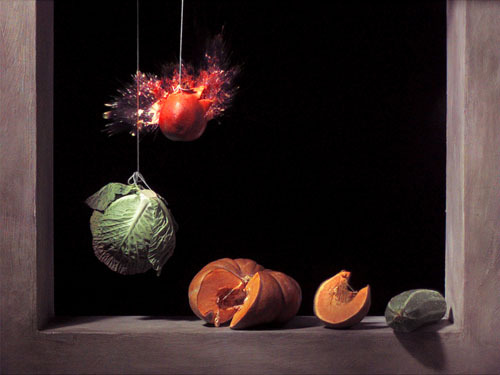 But as a genre, albeit from a different era, still lifes are more than simple adornments. Small or monumental, religious or scientific, symbolic, ostentatious, sometimes moralizing, still lifes are battlefields. Molding grapes, worm infested leaves, the juxtaposition of the innate with the last, vivid pulsations of the barely dead… still lifes often make still. playing with Juan Sánchez Cotán’s ‘bodegones’. 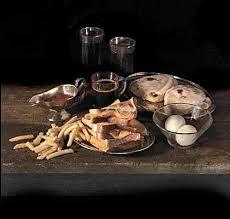 Mat Collishaw’s last meals on death row, rearranged in the style of a 17th century Vanitas painting. Transience of life. Certainty of death. The willful in between. And for now, a stumble, a fall and a soft drink. Posted on 26 August 2015 by MrsCalvo	This entry was posted in Popular Culture and Entertainment and tagged Damien Hirst, Juan Sanchez Cotan, Mat Collishaw, Ori Gersht, Paolo Porpora, still life, Tracey Emin. Bookmark the permalink.